One of the most critical tasks you can complete before winter arrives is to prepare the soil in your Hunt Valley garden for next year’s spring thaw. Now that fall is here, your garden is preparing to go into hibernation for the winter. So is the landscape around your home, for that matter. One of the most critical tasks you can complete before winter arrives is to prepare the soil in your Hunt Valley garden for next year’s spring thaw. Weeds can pop up whenever your garden is active. If you’ve seen an infestation of weeds growing around your Hunt Valley home, then it’s time to take action. Attack the weeds from the root, and pull all of them out of the garden bed. Get rid of any debris from dead flowers or other plants and leaves that might have fallen from your trees. That way, you can stop insects and diseases from lurking in your garden soil and causing problems for you in the spring. Next, you will need to test the pH of your soil. You can do this with a soil testing kit, or take a sample to a testing facility. When you use the kit, however, you’ll notice different colors indicating the pH levels of your soil. By doing this, you can determine how nutrient-rich your garden is, and how acidic or basic it is as well. Agricultural lime and sulfur can be used to change the pH level. 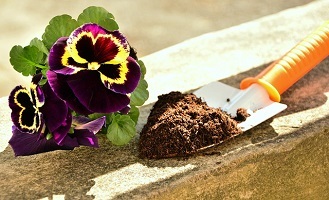 Another way to prepare your Hunt Valley garden for next spring is to use some compost. Then, make sure the layer isn’t too thick; ideally, it should be somewhere between 2-4 inches. Adding compost adds texture to the soil and helps it retain moisture, which will help sustain all of your plants during the cold and dry winter. One last step is to add a layer of mulch. The mulch will help keep the plants in your garden warm and prevent any water from evaporating. Putting down a layer of mulch will also discourage weeds from creeping back into your garden. You won’t need to add any new fertilizers to your garden soil. That’s because any nutrients you add now will be gone by the time spring returns. You will need to add the fertilizers in the spring instead, once it’s time to add more mulch and restart your garden. Trust Lehnhoff’s Supply and Design for All Your Soil Needs! This entry was posted on Friday, October 12th, 2018 at 9:48 am. Both comments and pings are currently closed.